My lovely friend Sam made the kids beautiful Xmas stockings a few years ago, unfortunately they stayed at our holiday home in Kenton, the place we have spent Christmas every year for the past fifteen years. This is the first Christmas we will not be there. I have never really had to do anything Christmassy to our own house as all the decorations and traditions were already in place at Kenton. This is the first year we are having Christmas at our own home so I am going to make an extra special effort to make it fun and festive. 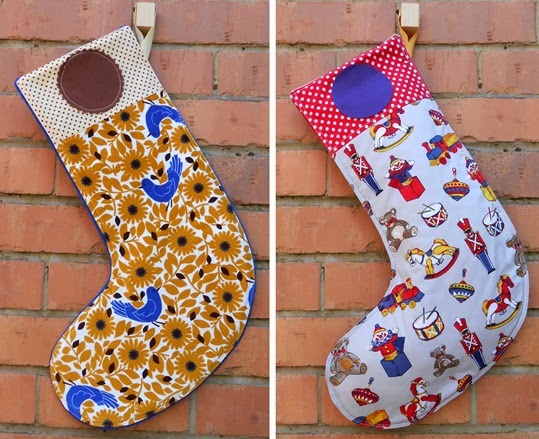 I have started sewing Xmas stockings (one for each member of our Aussie family - 12 in total). Good thing I have started early because they are a bit of a mission to make. Here are some pics of my first two stockings. I have had the names of the family member embroidered on little banners that will be ironed onto the felt circles. I love the one on the left, it is made from a beautiful velvety fabric.